Since launching our Lost Treasures multiplayer DLC update in June, we’ve been hard at work fine-tuning the multiplayer experience, launching the New Devon bonus map, and developing our next DLC release — the Uncharted 4 Multiplayer: Bounty Hunters DLC, available today via a new update to Uncharted 4. With a returning fan-favorite map, new tools to capture and create your own original gameplay videos, an all-new objective game mode, new weapons, and more, Uncharted 4 Multiplayer: Bounty Hunters DLC is one of the biggest multiplayer DLC updates we’ve ever produced. Most importantly, just like Lost Treasures and all future multiplayer DLC updates, Bounty Hunters is free for all players. Here’s a closer look at what’s included. That’s right; we’re bringing back Village. Not only is it one of our personal favorites, it’s also one of the most requested maps from the Uncharted 4 Multiplayer community. Village has been completely rebuilt to take advantage of PS4, including new lighting systems, high-fidelity textures, and more. We’ve also added support for Uncharted 4’s new traversal mechanics — most notably the grappling hook. We’ve heard your feedback asking for new modes for Uncharted 4 Multiplayer, and today, we’re proud to introduce Bounty Hunter — a new game type that encourages teamwork, strategy, and skill. Two teams compete to reach the score limit by collecting Bounties from KO’d players. When you KO a player, they drop a Bounty worth 10 points, which you or your teammates must retrieve before an enemy can swoop in and deny it. Throughout the match, teams will also alternate between having one random player assigned the role of Captain — a high-value target that the opposing team must hunt down within a time limit. If the attacking team can successfully KO the enemy’s Captain, they’ll have a chance to collect a huge Bounty worth 60 to 120 points toward their team’s overall score. However, there’s a catch: Captain’s Bounties take time to collect, so players must work together to either protect their teammates as they retrieve the Bounty or fight to deny the attacking team before the clock runs out. We love playing this mode at the studio and we hope you enjoy it, too. It inspires some incredibly tense moments and close plays. We’ve also introduced a collection of new weapons and boosters, as well as a new Mystical, which can be obtained through DLC Gameplay Chests. Using Relics earned through Multiplayer matches and Challenges, DLC Gameplay Chests now have the chance of granting access to any of the four new weapons introduced with the Bounty Hunters DLC, as well as those added with Lost Treasures and as part of the base game. Our latest Mystical, Shield of Asgard, temporarily reduces incoming damage. While it can be helpful in objective modes, it comes at the cost of movement speed. As promised in the Multiplayer Roadmap we shared before launch, the Bounty Hunters DLC adds Cinema Replay — a new suite of tools for capturing epic moments in-game and creating your own original videos. 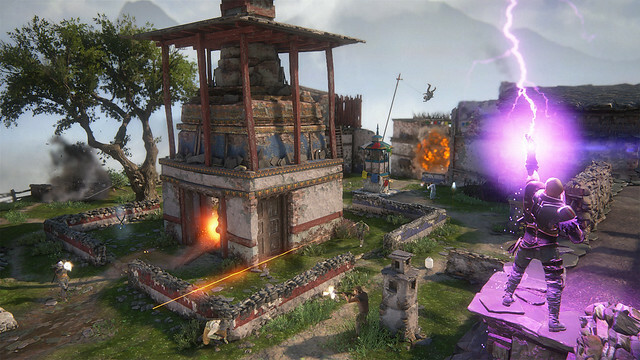 Building upon the tools players will recognize from previous Uncharted games, Cinema Replay creates archived versions of matches that allow you to go back and relive every moment from any player’s perspective or through a variety of different cameras. Within Cinema Replay, you can pause, slow down, swap perspectives, or line up the perfect shot to create highlight montages, original videos, or perhaps a dance compilation or two. Between Cinema Replay and the PS4 ShareFactory app, we can’t wait to see what kind of videos you create. This time around we have focused on a Wild West and Post-apocalyptic theme. We also introduced a few Pirate themed taunts that are sure to entertain. Multiplayer Pack 2 for the Triple Pack owners will also be available today. All your new items can be found, ready to use, in the customization and loadout menus. So there you have it, a detailed overview of what’s included with Uncharted 4 Multiplayer: Bounty Hunters and version 1.13. We hope you enjoy it and continue to share your feedback with us. For all the latest, be sure to follow Naughty Dog on Twitter, Facebook, and Instagram. Does this update include HDR support? ¿Cuando estará disponible el modo cooperativo? Will there ever be multiplayer trophies? Why does triple pack owners get the ******est stuff? Thank you so much for your update, it’s incredible to see how Uncharted 4 is becoming even better and more addictive. Do I have a question? How long will you support UC2 and UC3’s multiplayer on PS3? I love those games (especially UC2) and I still play with these games’ multiplayer modes and I hope you don’t want to shut down the servers anytime soon. Please confirm that I write the truth. Thanks for reading it and keep the great work that you’re doing on UC4! Very happy about Bounty Hunter. Will there ever be co-op survival like U2 and U3? My friends and I really miss that. IKR!! I really miss that too!! WHEN WILL WE GET CO-OP???? Cinema mode wasn’t in the base game? I never noticed lol. The main reason I couldn’t get into U4 multiplayer I guess would be the downing system. It works for a slow, brutal game like The Last of Us, but Uncharted is a very fast paced game. I spent a lot more time with U2 and 3’s multiplayer. Same here, played A LOT of U2 and U3…but the MP team on U4 introduced way too much useless stuff into the MP this time, way too much gimmicks, and stuff taken from TLoU, don’T get me wrong I loved TLoU MP, but the 2 games are diffently paced and ND MP team should have get that. Can we get a classic mode so the game plays more like Uncharted 2 or Uncharted 3 MP. I think I hate Uncharted 4’s multiplayer and I get the feeling so does my clan. We played one round before they all jumped on rocket league (another game they were sick of playing). I don’t get what is the fun about more weapons and more mysticals, it just make the game less and less balanced. I never had as much fun online as in Uncharted 2 and the number of guns was low, was FAIR and FUN. quantity quality. I’ll never buy a ND game again on day-one, as much of a ND fan I am, I bought U2-3-4 and TLoU on day-one but 80$ (here in Canada) is way too much for a SP game without a fun (read “balanced” and non-gimmicky for ME) MP that add legs to the game. I’m Canadian too. Don’t sell the cost short, after tax for me it was about $90 lol. :O That’s a LOT of money for any base video game. I got it right away mostly so that I could experience the story right away without being spoiled online. You never know where spoilers can pop up! But yeah I do agree with you. I didn’t play as much U3 multiplayer for some reason (maybe it was the addition of killstreaks? I loved the moving maps), but for U2 I loved rushing for the RPG on Village once the tank came out. Very simple yet fun gameplay. Really glad to see The Village coming back since I played the hell outta UC2 online and still play it to this day,such wonderful online.But I’m also glad to see propane tanks are back…ha really missed them on UC4 online,come on ND you should add it to all maps. And finally we got Cinema,the best thing in this update hands down…nothing better than the Cinema to catch proof of cheaters.Also it’ll help if the PS4 stops recording videos properly again. And I can’t believe you guys went and added weapons again…good old ND who never learn from their mistakes,you guys freakin ruined the online with the last guns which btw are madly overpowered…have they been nerfed?…doubt it…are the new guns as overpowered and unbalanced as the last ones?…I’m sure of it. Ah also nice move there on the video in the part that shows the Cinema…thought the video had stopped working lol. And Bounty Hunter mode is nothing but a disguised Kill Confirmed hu?…much like the Supremacy mode that was coincidentally just added to Destiny lol. This DLC is the last chance I’m giving to UC4 online…if I keep running in so much cheaters,people who only use P-90 and Arrowhead(aka overpowered weapons),and run n’ gunners…I’m quitting UC4 online as much as I love it.Y’all at ND are good at adding content but you’re just as good to ruin your game and never care about fixing it. Uncharted 4 Multiplayer has been a HUGE disappointment. Slow, boring and frustating gameplay. Congratulations Naughty Dog, you managed to launch 02 desastrous multiplayer experiences in a row(The Last of Us and Uncharted 4). Being a huge fan of Uncharted franchise, it’s really sad to see what Uncharted MP has become, especially after Uncharted 3. Uncharted 4 is the last one, and it was supposed to be the BEST in single player and multiplayer, but it FAILED on BOTH SIDES. Being a huge fan of Uncharted franchise, it’s realy sad to see what Uncharted MP has become, especially after Uncharted 3. Uncharted 4 is the last one, and it was supposed to be the BEST in single player and multiplayer, but it FAILED on BOTH SIDES. Stop confusing opinions for facts. Every time an update has come out since the new aiming options (Acceleration Speed, Ramp Power Scale) were introduced, I’ve hoped they would apply them to the single player as well. Unfortunately, that hasn’t been the case. Any idea why? I loved the campaign of course, but I found the aiming mechanics to be quite troublesome compared to previous games. Please tell me when the SP DLC arrives they’ll finally implement them! I would boot it up again since it’s been a while but im sure the random gun chest are like 8000 relics or something so no thanks. Are the new costumes 10,000 relics now as well? @Luis – U3 Multiplayer was just awful. Hell yes! Thank you ND. I don’t play a lot of games online but I’ve been playing Uncharted 4’s multiplayer almost every day since release. These updates are perfectly timed keeping it fresh. I would be interested to see a “classic mode” since everyone seems to be a fan. I never tried it since I only recently became an Uncharted fan when the collection came around. I was really excited about the return of cinema replay, but unless there’s something that I’ve overlooked, it’s missing a lot of features that were present in Uncharted 2&3 (lack of advanced camera controls like FOV and tilt, no DOF, no brightness or tint sliders…). I know implementing features isn’t a trivial process, but I can’t help but feel let down about what is unambiguously a downgrade on a feature I was really really fond of. Any news if there is going to be Single Player DLC for UC4? AND STILL, THERE IS NO CO OP!!! I DON’T GIVE A DAMN ABOUT COMPETITIVE. Couldn’t agree more with your comment & the one directly below. AGREED!! Where’s the CO-OP, Naughty Dog?? its actually cool want the lowe-s pretty badly! Enjoyed the single player campaign but have been waiting & waiting for Co-Op just recently went back to UC3 Co-Op Arena/Adventure mode and had a blast playing it! Autumn is here so hopefully Co-Op modes will arrive ASAP. So I can unshelve this masterpiece of a game. Have played the single player campaign multiple times still haven’t Platinum currently at (78%) had to take a break after the speedrun trophy. Anyways back to MP have tried it out and just could never get into the current modes available. Also it would be really nice to have a splitscreen option like in UC3, UC3 MP Splitscreen brought hours upon hours of enjoyment for my daughter and I. Well keep up the great work and hope everyone has a good one. It’s time to give a break to UC4 multiplayer now. After the recenth patch the game has become completely frustrating with more overpowered weapons. This multiplayer is only for the jerks who rely only on their sidekicks like brutes, hunters and snipers and are good with their mysticals. They don’t have real skills and are always ready to use an extra hand for support. The latest patch is complete disappointment with more overpowered weapons. Honestly, don’t u think there is enough of weapons already. What is the point in releasing more and more heavy weapons and reducing the power of the ones which already exist. There are idiots who are ready to pay for Uncharted points and buy these weapons. Talking about sidekicks, I have faced this worst experience several times where all five members in my opposite team spawned sidekicks of their own. I remember facing two brutes, two hunters and a sniper all at the same time. What f****ng strategy is this. Hunter and Saviour sidekicks are equipped with guns as well. Though u escape, u will be attacked. We cannot restrict the number of sidekicks spawned by a team. But if I kill a sidekick it should get added to the team KOs too. This is the only way we can stop players using more and more sidekicks. As of now there is no use of killing a sidekick other getting some extra amounts. Mysticals, other irritating part of the game. Indira’s eternity – the person who gave this brilliant idea must be given super idiot of the year award. People can’t win a gun fight straight away throws this to slow his opponent/s and be happy to kill them slowly. Staff – what is the fun in playing a game when ur opponent knows where exactly you are and which way you are running. And the team of two can easily track u and take u down. At least I hope Co-op doesn’t have any if this ****** ideas and would be more fun same like UC3 & UC2. Indira’s eternity – the person who gave this brilliant idea must be given super idiot of the year award. People can’t win a gun fight, straight away throws this **** to slow the opponent and be happy to kill them slowly. I hope Co-op doesn’t have any of this stupid ideas and would be more fun same like UC2 & UC3. And why no one is talking about reducing the power of snipers. Other players at least use their skills to run around and put up a legitimate fight in the game. But what about the players using snipers. They stay as far as they can also using a sniper sidekick to cover their a**. One headshot and the opponent is down. Worst part is these jerks always camp at one place and can’t be moved so easily. Reduce the power of the snipers and that will put an end to these coward buggers. I don’t know why my comment about mysticals which I posted yesterday is still awaiting moderation. To be honest, I haven’t touched the game since late July cause I got tired of having to carry teams literally by myself into wins or close losses. I don’t know how they do the matching system, but it’s pretty frustrating when almost every game I’d score like 13 downs/11 KOs & 4 deaths while the person in 2ND PLACE ON MY TEAM scores something like 6 downs/4 KOs & 12 deaths. Hopefully co-op mode comes out soon since it’s fall now & hopefully it’s as good as Uncharted 3’s was.